Happy Monday to ya and welcome to day 1 of the Patsy Thompson Designs Blog Hop. Patsy has been so generous providing all of us who are participating in the hop designs to stitch out. AND....there will be one winner chosen from each blog this week to select a downloadable machine embroidery design from Patsy Thompson Designs as well!!!! How exciting is that? Being an admirer of Patsy's work for years now, I have always wanted to be able to achieve a feathered wreath (one that actually looks like a feathered wreath and not a lopsided loopy mess). My choice was a no brainer.... I choose the Majestic Feathered Wreath 1 & 2. Perfect beautiful wreaths....yep.....I can now achieve the same results using my embroidery machine. Earlier this year I visited Jinny Beyer's Studio and purchased some beautiful border fabric and a coordinating green fabric. Our kitchen is green and I thought the border print below would make a lovely table runner. Patsy's Majestic Feathered Wreathes on the black fabric and Jinny's border fabric on the outside.....how could I go wrong? How many blocks did I make? Twelve....yes...twelve! Why? I could not stop and I loved playing with different thread combinations. And....well....there were those two blocks that I cut into while trimming the batting for a trapunto block (we wont' talk about that). Patsy's designs are so much fun to play with and they are digitized very well. I used Patsy's method of centering blocks. She has posted a wonderful tutorial on her blog and you can read it HERE. (If you are a video junkie like me, Patsy has lots of amazing videos that you can find HERE.) You might notice I have double stitched each design (I just used the minus spool button and started each sequence again because I wanted the stitching to be a bit bolder). Trapunto takes Patsy's wreathes into another realm all together. They just pop right off of the piece squares. The stabilizer and thread I used was by Floriani. After stitching the blocks on 9 1/2 inch black fabric I decided that the blocks were too large proportionally given the border I wanted to use. Given I own so many rulers I knew I was bound to have the perfect one for the job....and I was right. This Creative Grids 8 1/2" Fussy Cut Ruler was just the ticket! I just laid the ruler over the top of my blocks and centered it over my design and rotary cut away the excess. I'm one who hates fiddling with rulers so this made my job uber easy. I have no clue as to how I acquired this ruler...but I sure was glad I had it because it made cutting those triangles and corners a breeze. You can find one HERE. Back to those amazing Wreaths!!! The border fabric on the side was approximately 3 inches wide. Somehow the border seemed too thin. If I used the wider border print it might take the focus off the Feathered Wreaths. What about using the wider border just on the ends? That looks pretty good....or so I think. Next I need backing, batting and a binding. I got as far as cutting the batting and had the thought.....What about making this table runner reversible? Since the Feathered Wreaths are so much fun to make I thought I could make one identical to this one using different fabrics and colors and have two table runners in one. I have not decided just yet. The quilting will be fun because I'm going to outline the Wreaths and they will pop even more. You can really see that I used 2 layers of wool batting. What a great time I've had using Patsy's designs and I am so GRATEFUL she has been so generous...THANK YOU PATSY!!! There will be many more of Patsy's designs in my future :) Would you like to see them in your future too? Just leave a comment on this blog post telling me which of Patsy's designs you like best...you can find them by clicking HERE. Did you know Patsy has recently added Pre-Cut Applique Shapes too? You can see all of them HERE. Would you like 5 extra chances to win? Sign up for Patsy Thompson Designs Newsletter by clicking HERE. Best of luck to everyone and be sure to stop at each of the blogs to increase your chances of winning. Wow.... makes me wish I had an Embroidery machine!!!! Well I might have to get one!!! I love love love her feathered star motif - just gorgeous! your runner is just gorgeous Kelly. I love so many of Patsy's designs. I am glad I don't have to choose again. Ha ha. Love the work - need the machine! Patsy's hyperquilted wreaths are just too stunning! All of her designs are lovey but I like the feathered wreaths the best but maybe that's just because your table runner is sew AWESOME! I love the Tulip Quartet block. And the wreaths on your runner are gorgeous. What a beautiful wreath design that really makes your table runner look so beautiful. Great border fabric too! Inspirational - I really want to create a table runner with those wreaths. Of course, Pillows would also be great too! I like the Feathered Wreath Blocks. 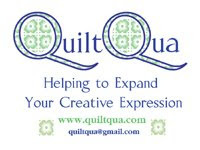 They would work on so many quilts! Those wreaths are gorgeous and make such a pretty table runner. I like the bird applique blocks too. Her designs are great. 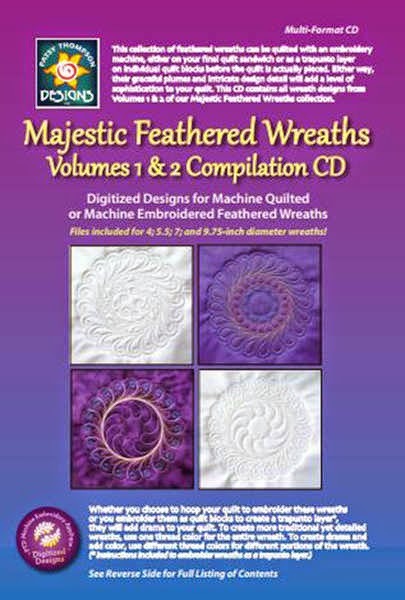 I don't have an embroidery machine but I surely do like those feathered wreaths. I'm in love with feathers and have been for a *long* time, so I really can't tear my eyes from that Majestic Feathered Wreath, Vol. 1-2 set! Gorgeous! I have to agree with you, the Majestic Feathered Wreaths are GORGEOUS and seem like they will be very versatile. Would love to get my hands on them!!! I have now signed up for Patsy's newsletters. Beautiful! I love Patsy's designs. I have been following her with Google Reader and then Feedly. The designs seem to shimmer and have a special "pop" to them. I would never have thought to add the wider border on the ends of your runner; that is so creative. I'll be watching to see what you've decided to do for the reverse of the runner. Pasty does such beautiful work. A6 The Asymmetric In-lined Curley Cue Feathered Wreath Is my favorite! Very pretty designs. I love the table runner! Oh my, they are just beautiful! I'm sad though that I don't have an embroidery machine. Oh, idea! A trip to visit so I can make my own on your machine. What do you think? Retiring in four weeks so I will have loads of free time. Yippee! Love them all. The feathered wreath is beautiful. I love the table runner. Thank you for introducing me to Patty's designs. I've signed up for her newsletter and will be interested in what she creates next. I really like the Flirty Flower applique...so pretty! I love her feathered wreath designs but any of her designs are gorgeous. Love your table runner. I love Patsy Thompson's designs -- all of them. There is no way I could choose just one, but I've been admiring her birds for years. I like the Tic Tac Tulip Quilt! The feathered star is very pretty! I like her Corner Setting Triangle Feathers Pair. Your wreaths are gorgeous too! I love how your table runner came out and that black fabric was the perfect fabric to highlight those wreaths! Kelly, these feathered wreaths are gorgeous and your color choices and border for the table runner are spectacular. This is all absolutely beautiful. Your table runner is beautiful, Kelly! I absolutely love those feathered wreaths! They look fabulous with your Floriani thread! I love her coner setting triangle set! She has so many beautiful pattern! She is amazing love her work! I'm new to machine embroidery. I love all of her design haven't done any yet. I love the Majestic Feathered Wreaths 1 best. I love the feathered spine wreath! Gorgeous! Love, love those feathered wreaths! great idea. Thanks to whoever set this up. I'm looking forward to visiting all of the blogs. Kelly, your table runner looks terrific!